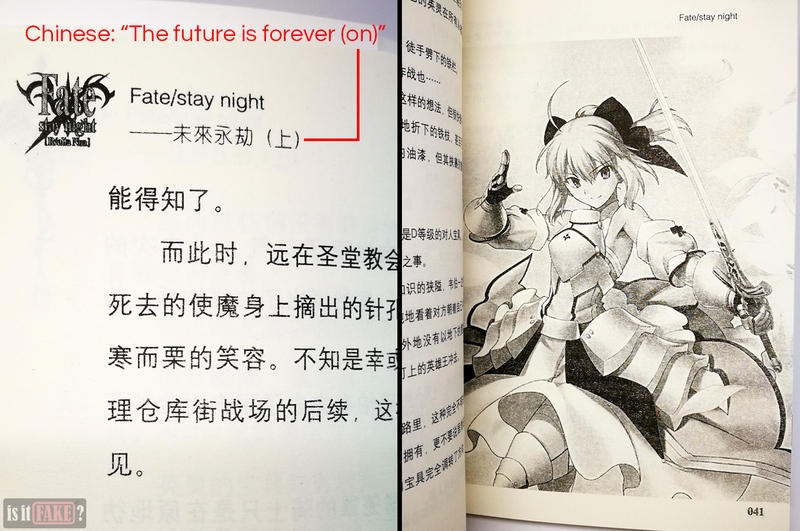 Like the legends of King Arthur, Fate/stay night continues to endure the passage of time. The franchise’s longevity can be attributed to a lot of things: its inspiring stories of courage, sacrifice, and passion; its slick animation and art design; and of course, its cast of memorable characters. 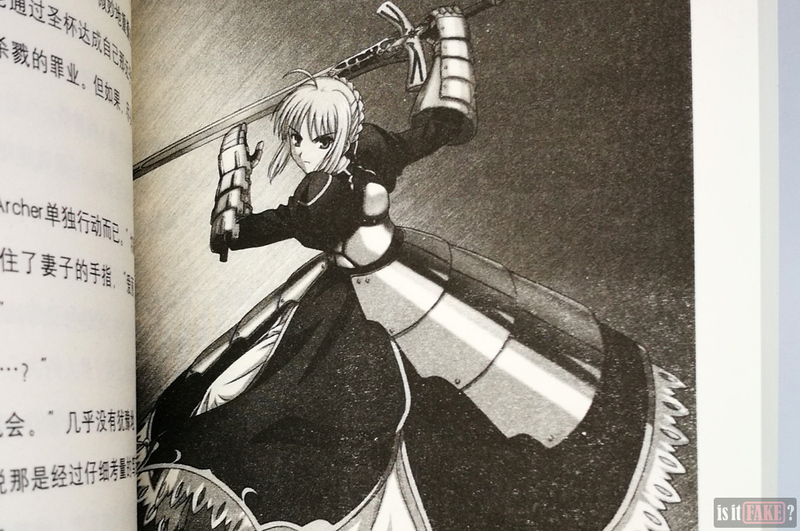 It’s no exaggeration to say that even a non-fan would instantly recognize Saber no matter what medium she appears in. To Fate/stay night’s detriment, its popularity has also proved costly. Fake Fate/stay night merchandise abound worldwide, siphoning off the content creators’ profits – profits that should instead be going into the production of more officially licensed material. 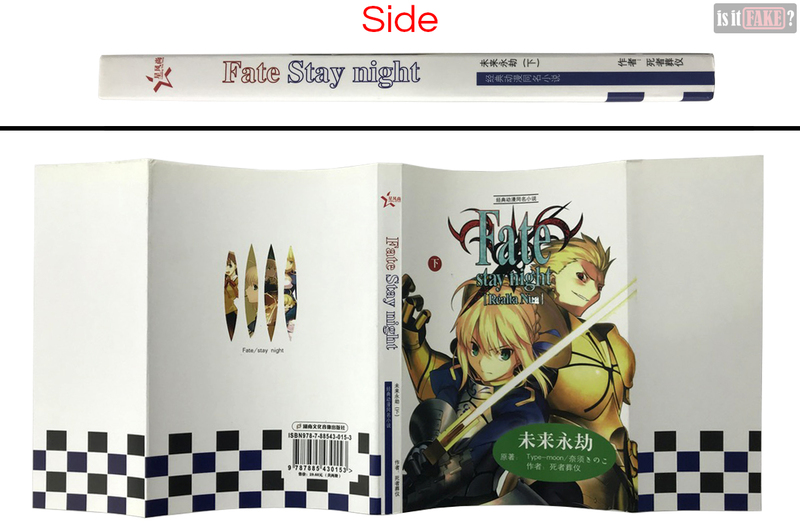 Bootleggers have even gone so far as to manufacture Fate/stay night books designed to look as legit as possible. Unbelievable, yes, but read on and see for yourselves. Like other Chinese online stores, Taobao isn’t the ideal place to wind up in if you’re scouting for original items to buy. 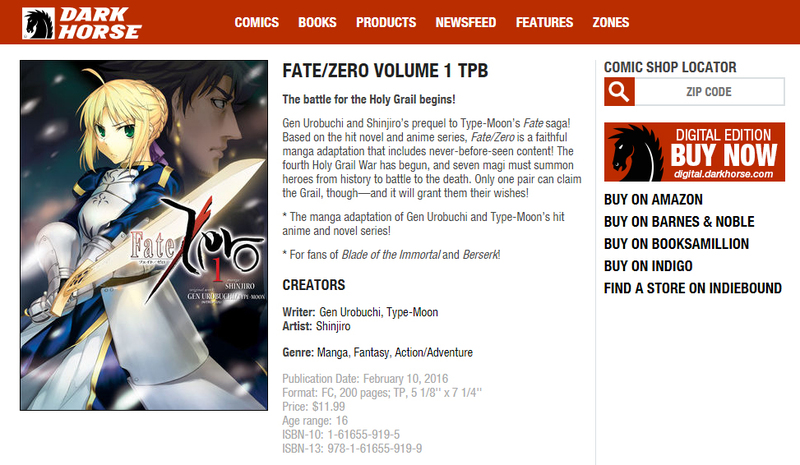 The site is brimming with pirated goods of all shapes and sizes – including anime books. 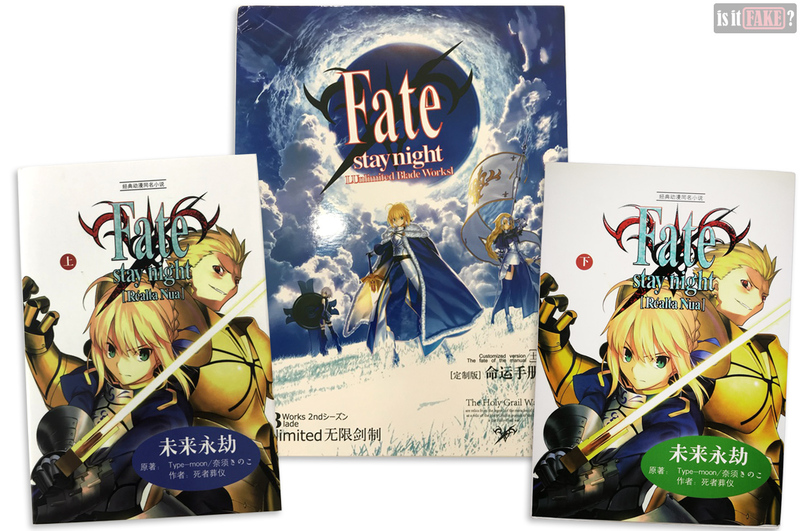 We found this Fate/stay night light novels and art book bundle on Taobao. To those unfamiliar with bootlegs, these items might look like the real deal. After all, why would pirates go through the trouble of printing books? But this is hardly the first time China has produced books based on iconic properties. Remember all those fake Harry Potter books such as Harry Potter and the Leopard-Walk-Up-To Dragon and Harry Potter and the Chinese Overseas Students at Hogwarts School of Witchcraft and Wizardry? Yes, those lovely tomes are Chinese in origin. 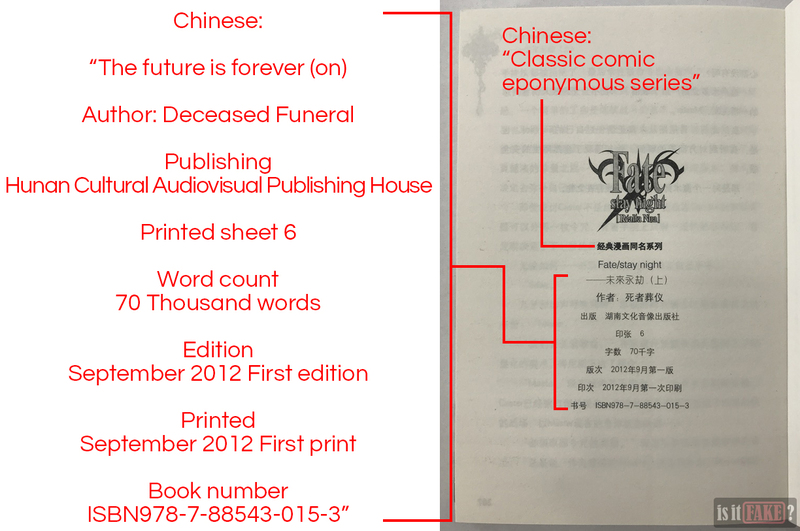 The fake books in the bundle claim Hunan Cultural Audiovisual Publishing House as their publisher. While this is an existing, state-owned Chinese enterprise, there is no proof it published these books. It’s possible the bootleggers simply used the name to give their product a semblance of legitimacy. The books also mention another organization: Star Fashion. Unfortunately, there is no information about Star Fashion on the internet. Whoever they are, it’s clear they’ve been up to no good. 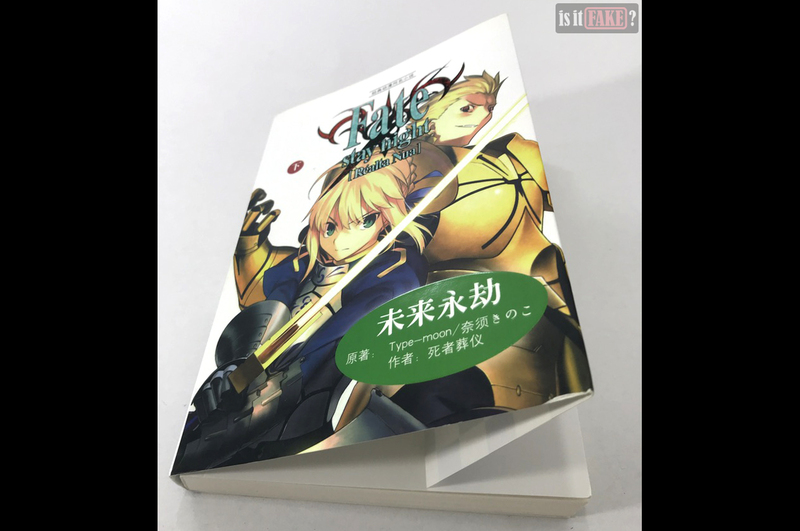 At first glance, the first fake Fate/stay night light novel looks like any standard light novel from Japan. 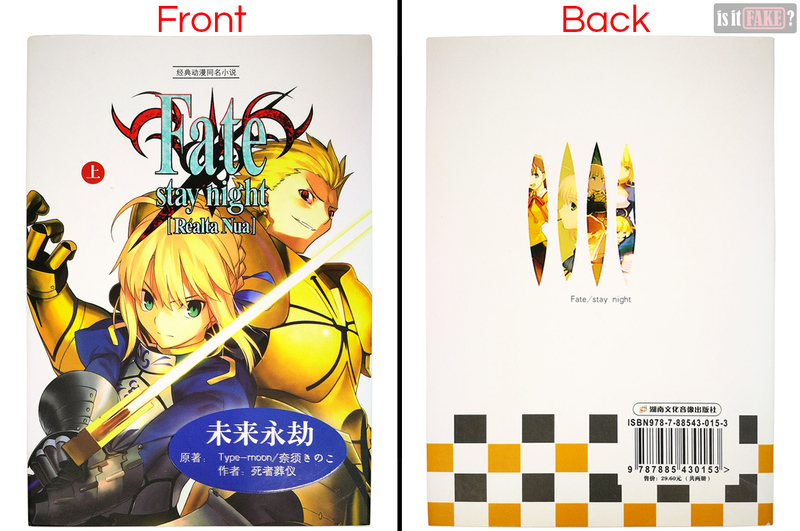 The series’ official Realta Nua logo, as well as an image of Saber and Gilgamesh, adorn the front cover. There’s even a barcode on the back, and what looks like the publisher’s logo on the side. The Réalta Nua logo is the first sign of this item’s many problems. 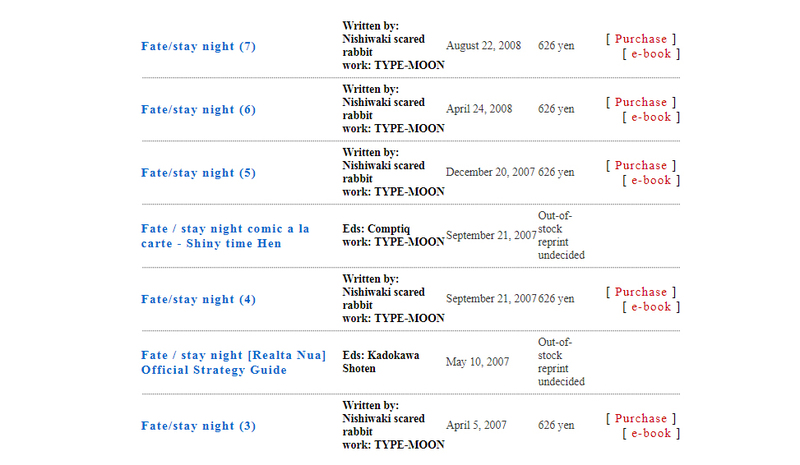 There have never been any official Fate/stay night Réalta Nua light novels. Réalta Nua is the title of the Fate/stay night visual novel released for PlayStation 2, Windows, and the PlayStation Vita between 2007 and 2012. 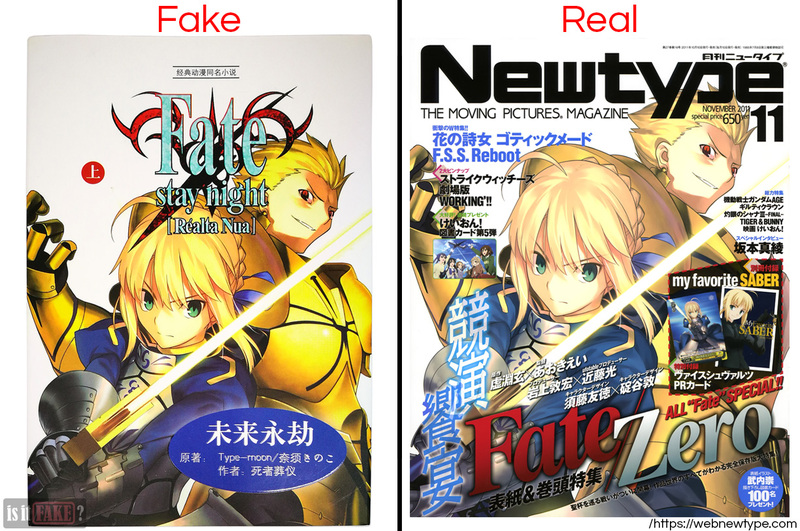 That image of Saber and Gilgamesh on the front cover looks totally legit though. That’s because it’s official art originally used for a cover of Newtype magazine, and that has since been making the rounds on the internet. We’re willing to bet the manufacturers of this fake book took this art without the content creators’ permission. The colors on the fake are darker and feature higher saturation, effectively masking some of the finer details and making the whole picture less attractive overall. The front cover is replete with Chinese, as you can see in the image above. Case in point: the blue oval on the lower right. 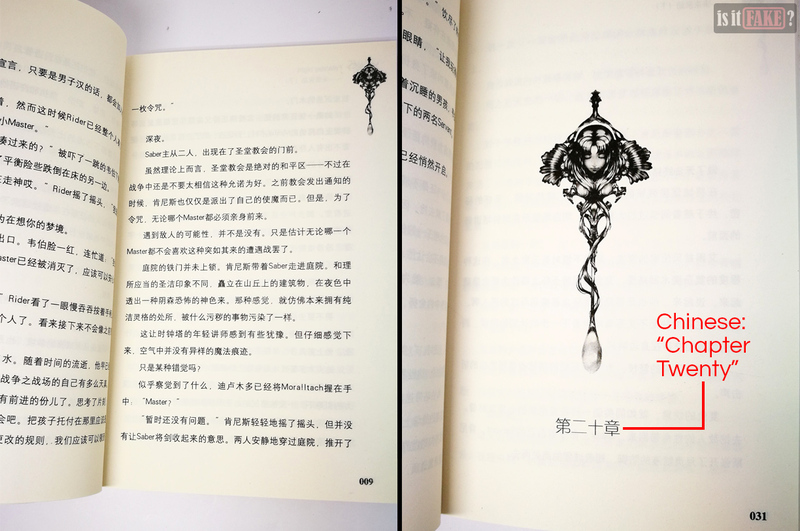 The blue oval is emblazoned with 未来永劫, which translates to “the future is forever.” This is the book’s title. 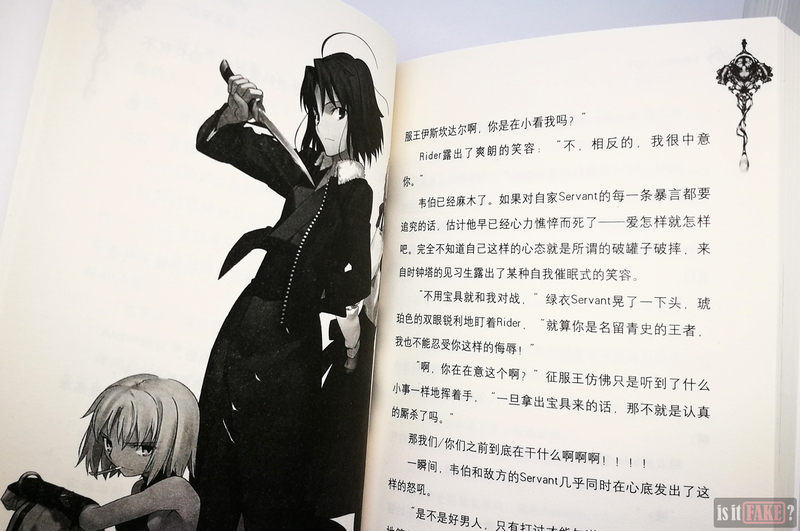 This section also acknowledges the series’ original developer (Type-Moon) and writer (Nasu Kinoko), but then goes on to say the book was authored by a certain 死者葬仪, or “Deceased Funeral.” More on this person in a bit. The image on the back is off-center, making for an awkward look. 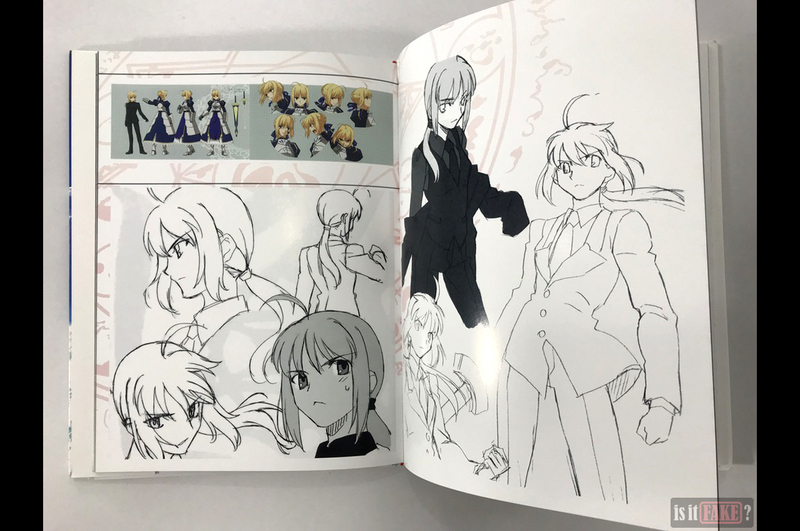 It was taken from the official Fate/side side materiale complete compilation book, which gathers in a single volume all the mini-art books packaged with the visual novels. 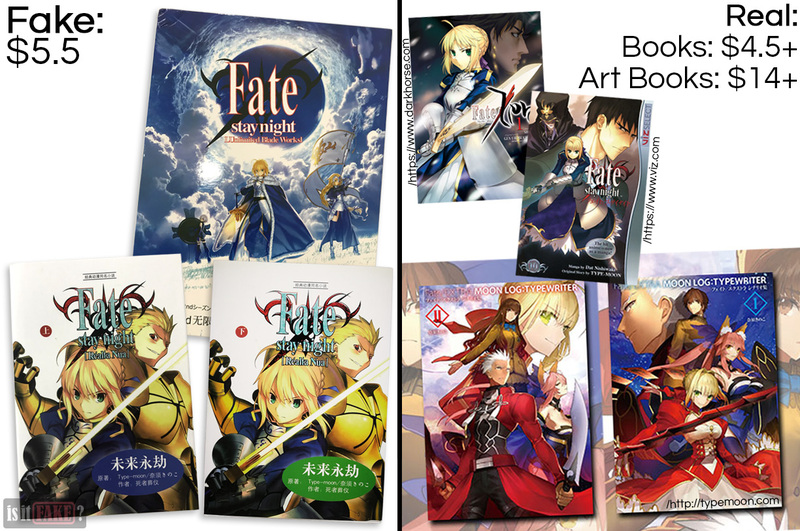 You can download these mini-art books from Type-Moon’s site; later on in this article, we’ll tell you how. 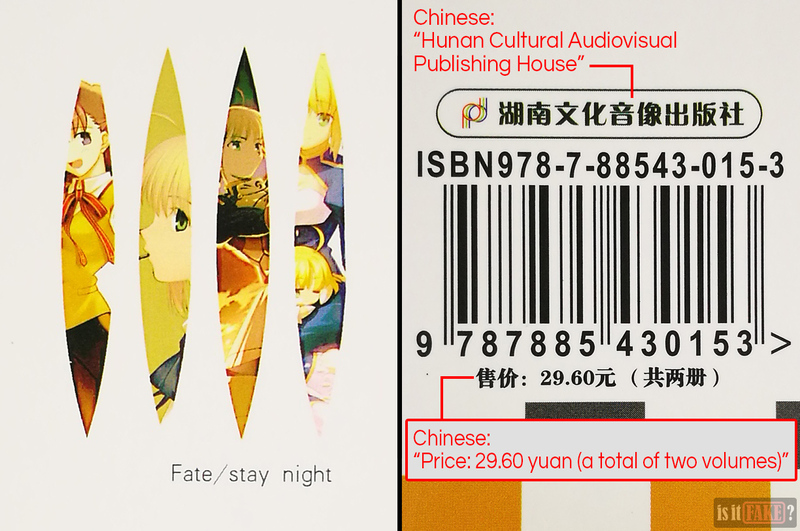 As for the barcode, it either yields no results, or none related to Fate/stay night when scanned. This is a red flag, because such ambiguity would not arise from an official product. Above the barcode is 湖南文化音像出版社, which translates to Hunan Cultural Audiovisual Publishing House. 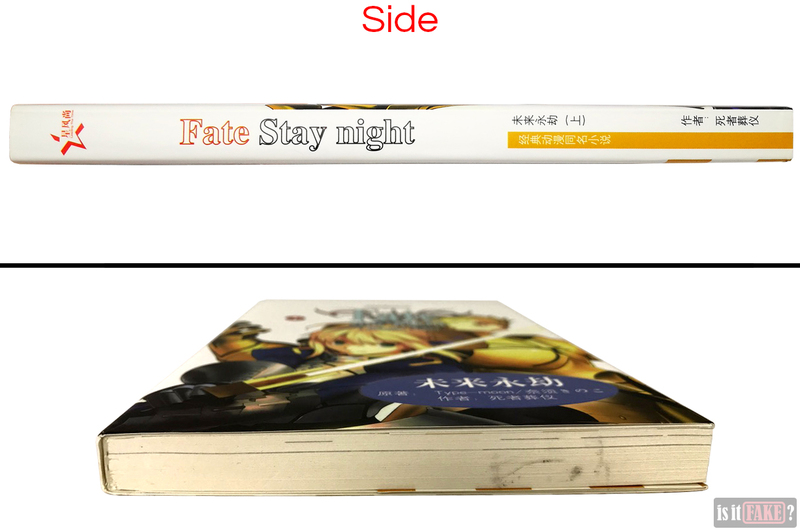 If we look at the book’s side, we see Fate/stay night misspelled; the forward slash has been omitted, and the “s” in “stay” capitalized. 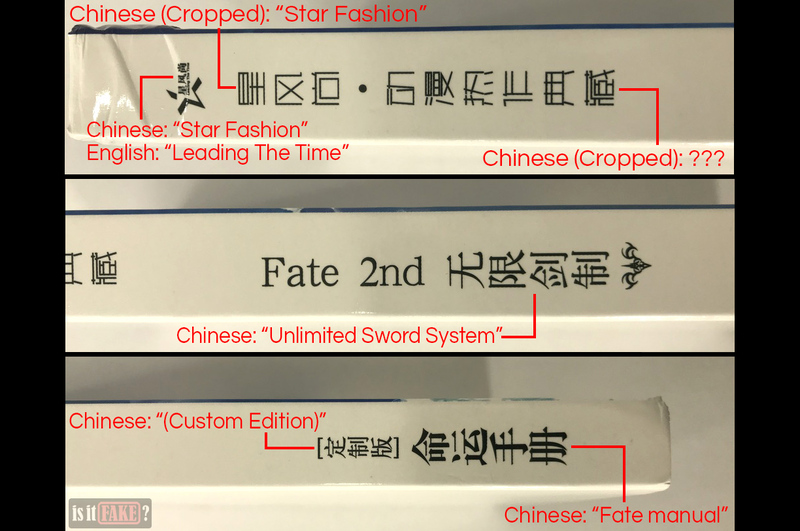 More importantly, we see a red star logo with the characters 星风尚, or Star Fashion. This logo is an edited version of the one used by the Red Star Design Award, a Chinese organization that gives recognition to innovative design in a variety of fields. While we can’t find any data on Star Fashion on the internet, there is information about the author, whose name you can find once again on the side of the book. In fact, you can find and read all of Deceased Funeral’s works on the internet – including every chapter of this fake light novel. 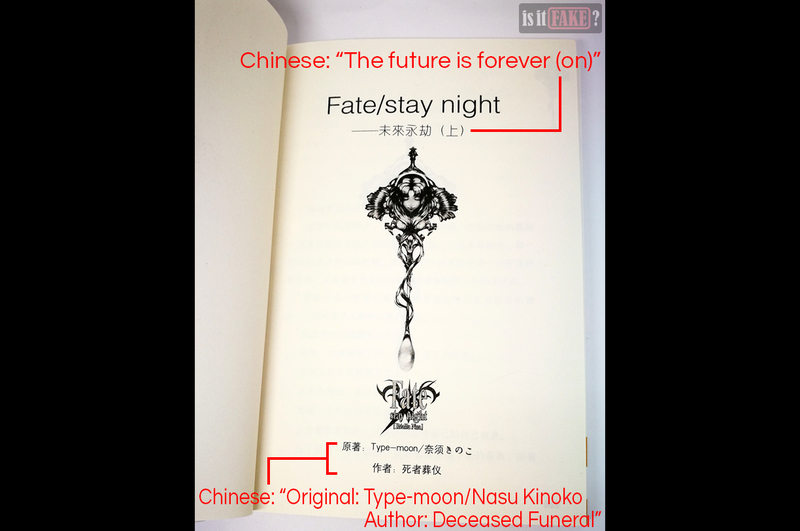 That’s because this light novel is nothing more than fan fiction; Deceased Funeral is not affiliated with developer/publisher Type-Moon or publisher Kadokawa Shoten in any capacity, making her light novel unofficial work. 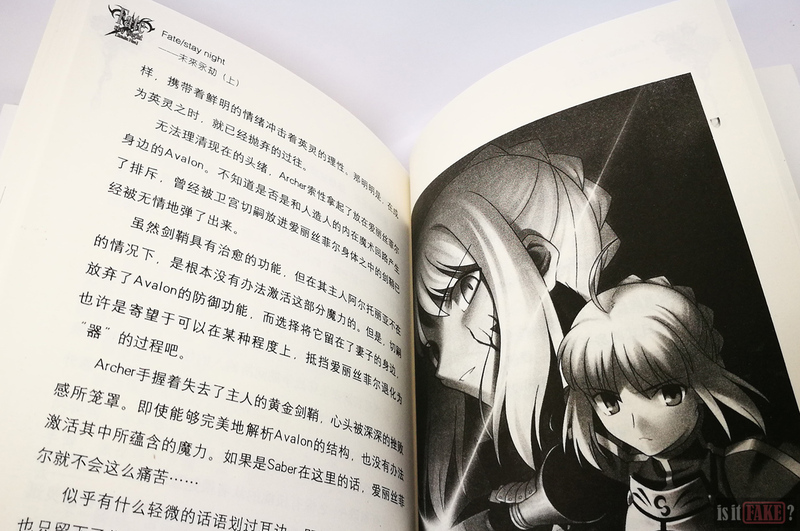 As it is doubtful Hunan Cultural Audiovisual Publishing House has anything to do with this light novel, it’s difficult to say if this book was published with or without Deceased Funeral’s consent. Also, as Star Fashion is a nonentity on the internet, we can’t say for sure how they’re related to Deceased Funeral. Without the dust jacket, the light novel looks like a plain paperback notebook. 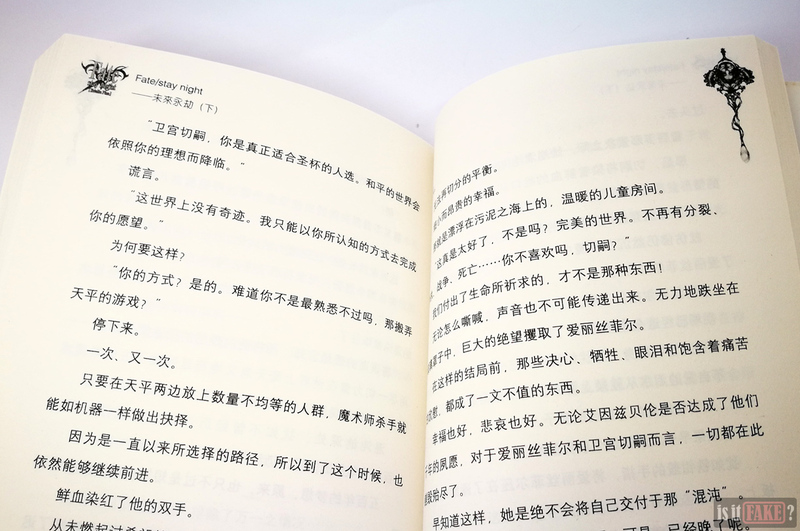 By now, it shouldn’t come as a surprise to you that the entire novel is written in Chinese. As mentioned previously, it matches the story found on the internet, word for word. 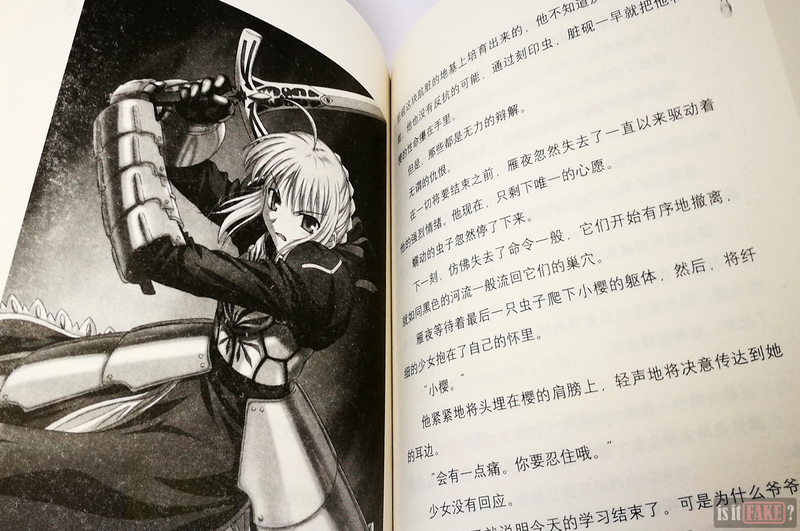 As for the pictures, they’re all images taken from various books published by Type-Moon. 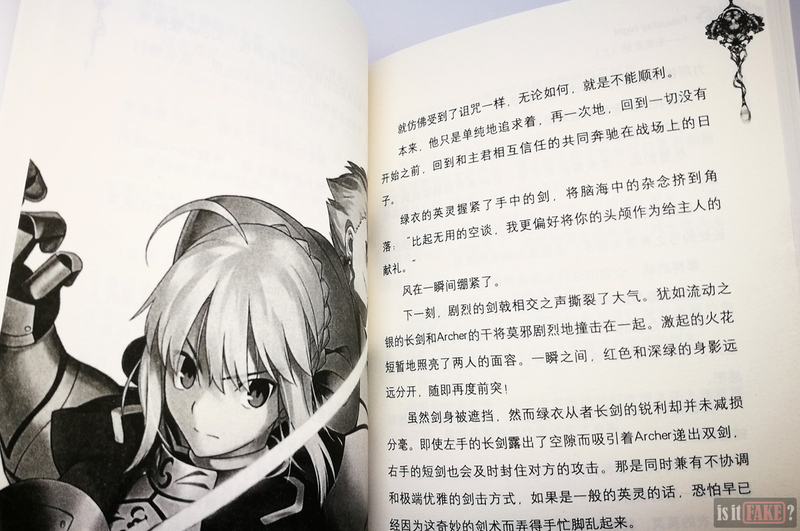 For instance, the symbol sandwiched between the titles in the opening pages of the book is originally from Type-Moon’s Character Material, a book that contains artwork and information about the series’ characters. 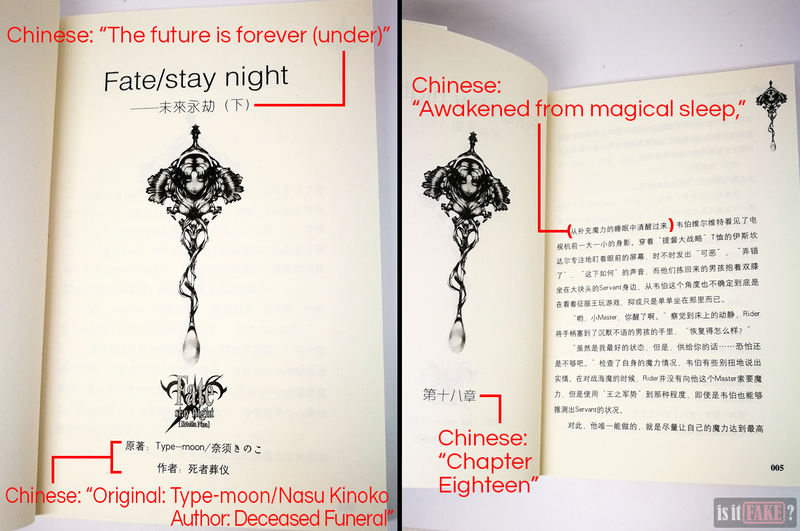 A page towards the end of the light novel lists down information about the book. 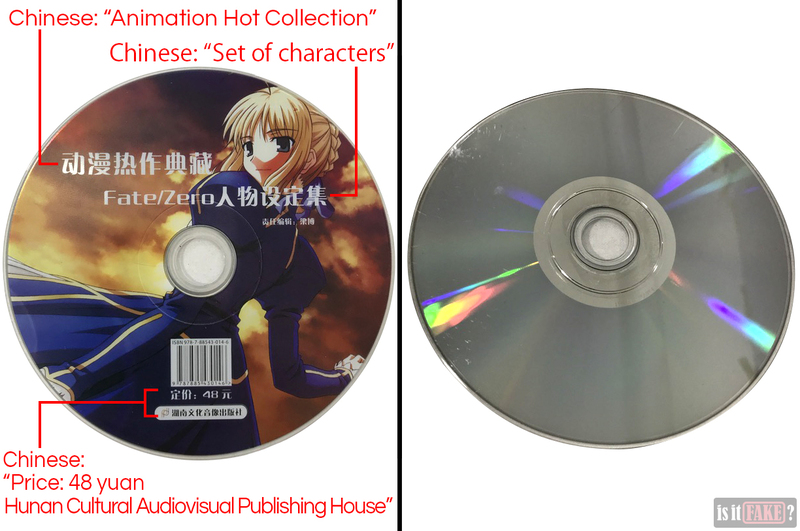 It once again falsely claims Hunan Cultural Audiovisual Publishing House as its publisher. It also mentions an ISBN number. ISBN stands for International Standard Book Number, which is used by publishers, sellers, libraries, etc. to identify a published book. 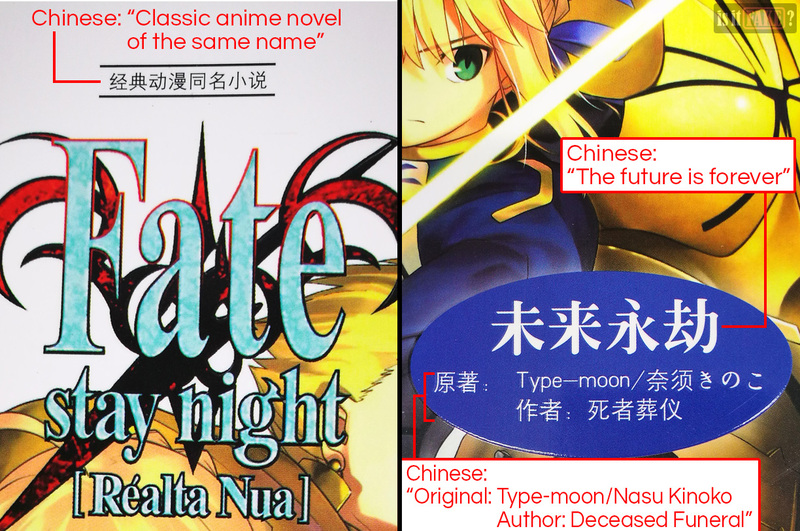 As expected, any research on the fake light novel’s ISBN 978-7-88543-015-3 amounts to nothing. The second book in the bundle is book 2 of the future is forever. Both the front and back covers are almost identical to the first book’s, except the oval is now green instead of blue. The image on the back is still off-center, but now the Anglicized title below it is aligned with it. The fake art book is larger than the light novels. 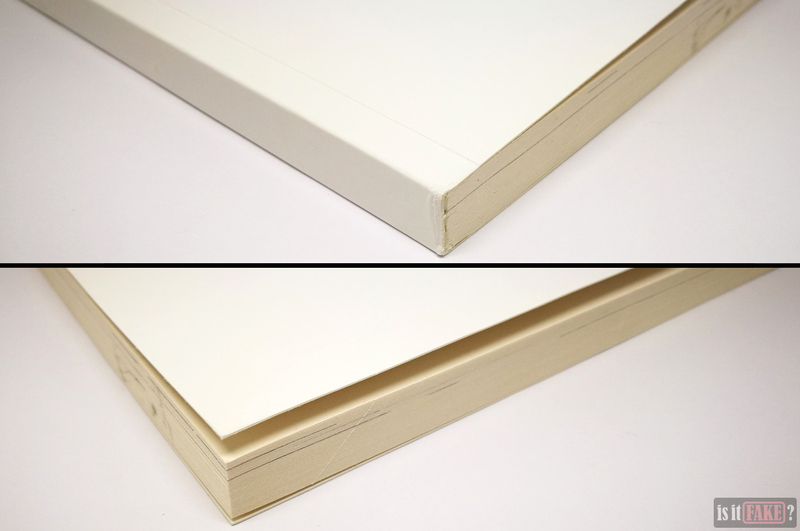 It’s also hardbound, with the dustjacket sheathing its stiff cardboard covers. 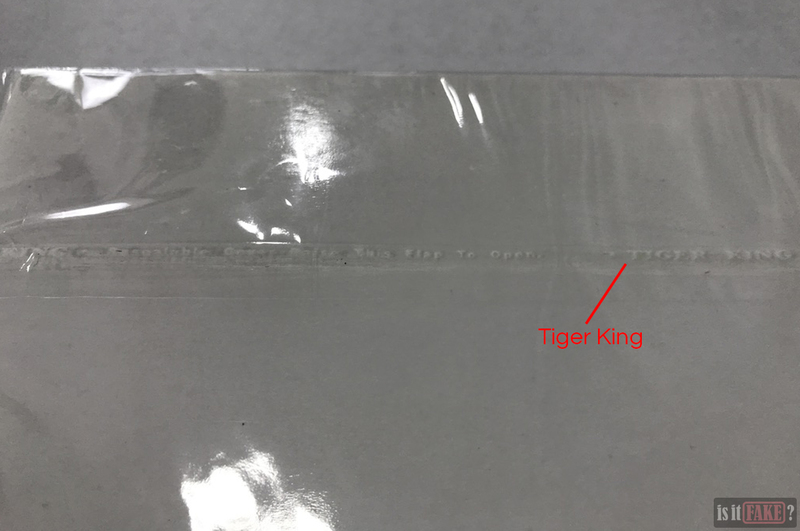 The fake art book is wrapped in cheap, clear plastic branded Tiger King. Like the light novels, the fake art book makes use of official imagery. The picture on the front cover is one of the artworks used in the promotion of Fate/Grand Order online mobile RPG. Like the images on the light novels’ front covers, the colors on this one are darker and have greater saturation. In contrast, the original picture boasts an almost moonlight-like luminescence, giving it a beautiful, heavenly aura. The fake once again uses the proper logo. But if you look closely, you’ll observe some weirdness with the Unlimited Blade Works portion of the title. The words aren’t in square brackets as they should be. Instead, the leftmost bracket has been replaced with an L, and the rightmost one with the number 1. A surplus of Chinese, as well as some English, festoons the front cover of the fake art book. The English is badly worded and abundant in grammatical errors. The back cover is almost bare save for the logo and the book title. We find the Star Fashion logo again on the side. The side also features some Chinese characters that are, unfortunately, cropped, making them difficult to read. 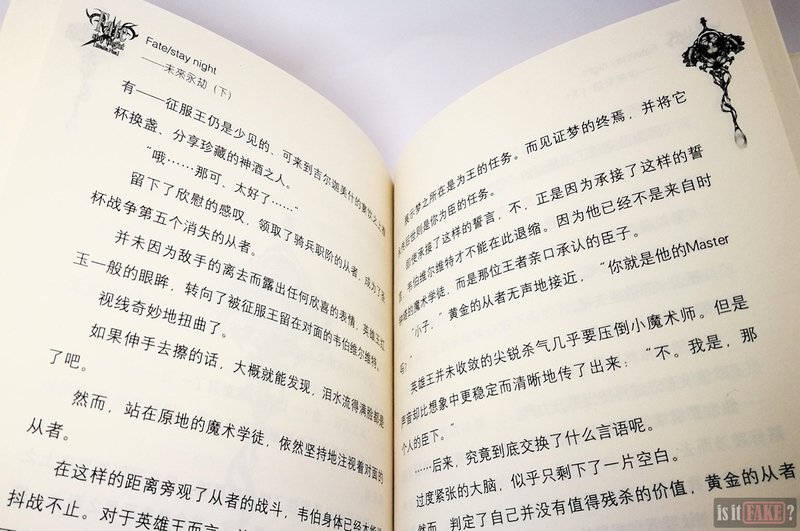 In addition, the book comes with a DVD that announces its publisher as Hunan Cultural Audiovisual Publishing House. 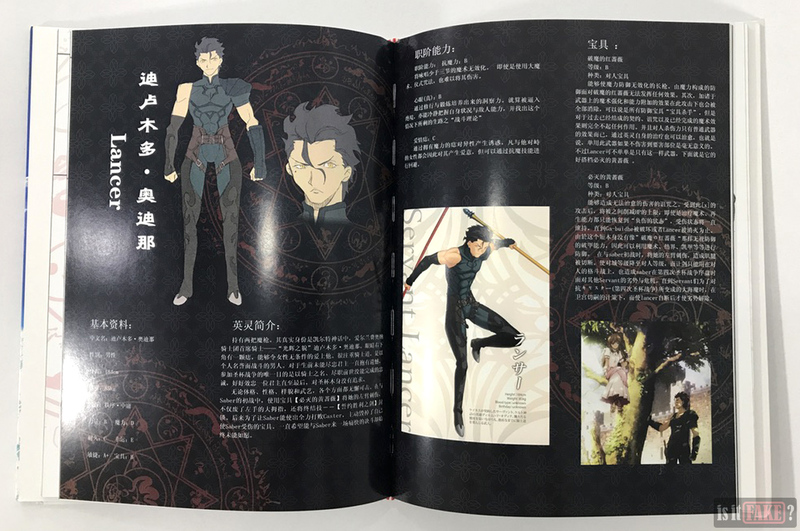 The pictures featured in the book come from various official sources. 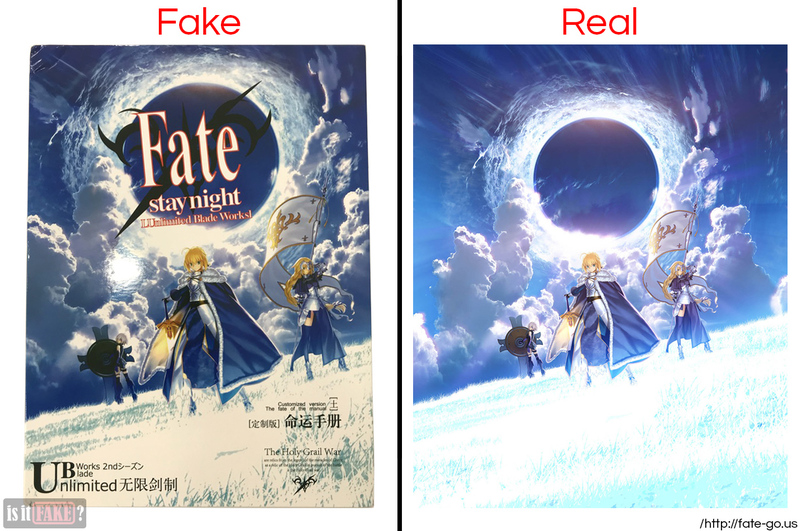 The leftmost illustration in the first image above, for example, is a darkened extreme close-up of artwork often used in Fate/Zero promotional material. You can see samples of the official version here, here, and here. 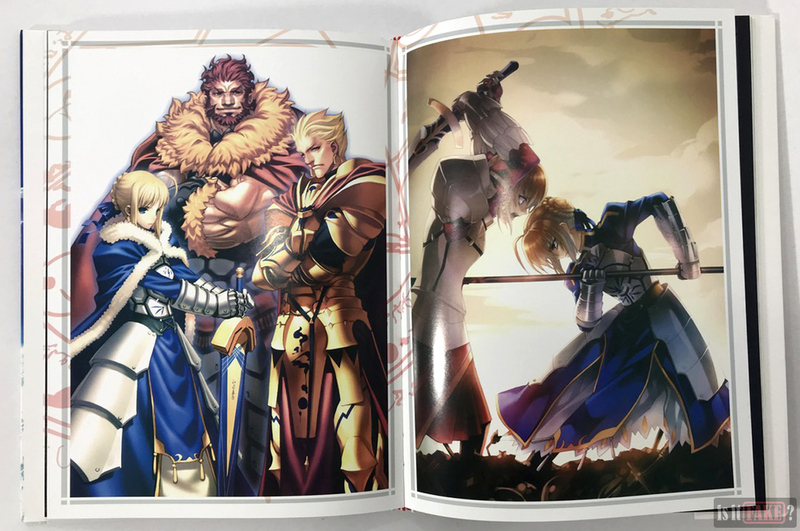 Similarly, the art gathering Saber, Rider, and Archer on one page was originally used on the cover of Type-Moon’s Fate/Zero Tribute Arts art book. Given the artworks’ eclectic origins, there’s little rhyme or reason to the way they’re presented and arranged. 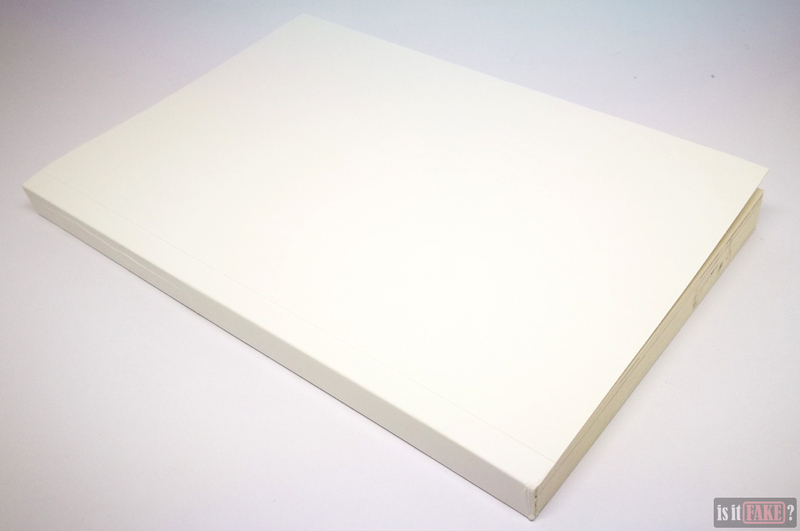 Adding confusion to the chaos is the fact that none of the fake art book’s pages are numbered. 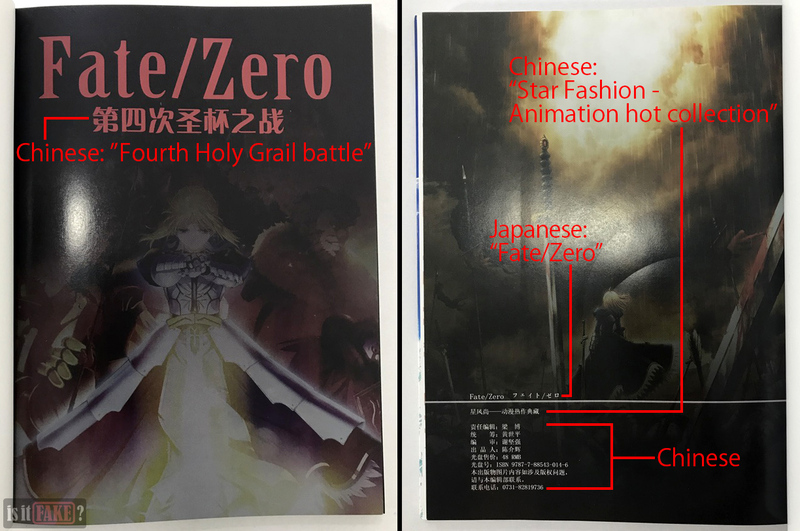 While one of opening pages mentions Star Fashion in Chinese and gives us the same ISBN as the light novels, the fake art book fails to make a single mention of Type-Moon or Kadokawa Shoten. 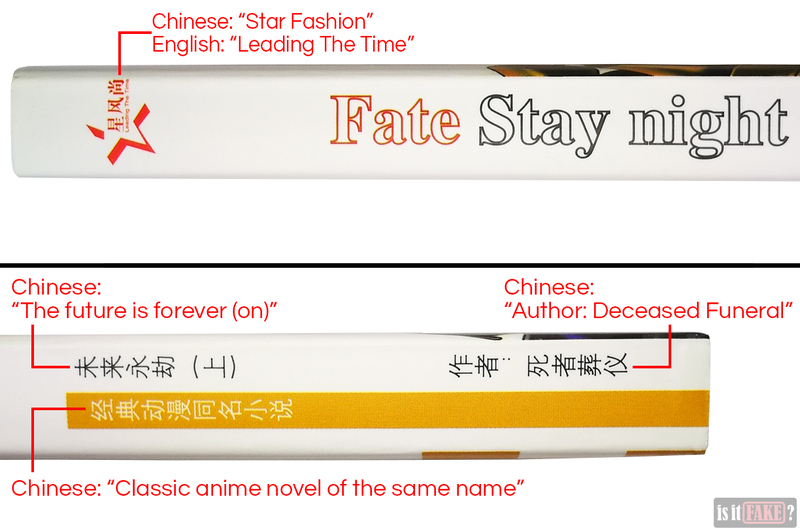 This is extremely telling, as these two companies are responsible for the major Fate/stay night book releases. 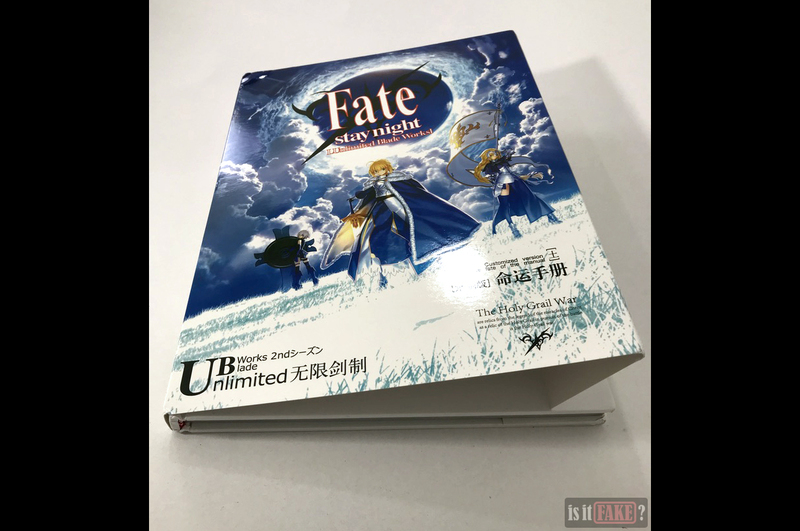 Official Fate/stay night books cost a little more than the fake, but not so much that they’re no longer affordable to the average anime fan. Light novels and manga cost around $4.5, while art books around $14. The best thing about them is that these are from real Fate/stay night writers and artists, so the stories and information are canon, and possessed of the same excellent quality you’ve already come to associate with the entire franchise. The good news? There’s no shortage of places to buy these books. 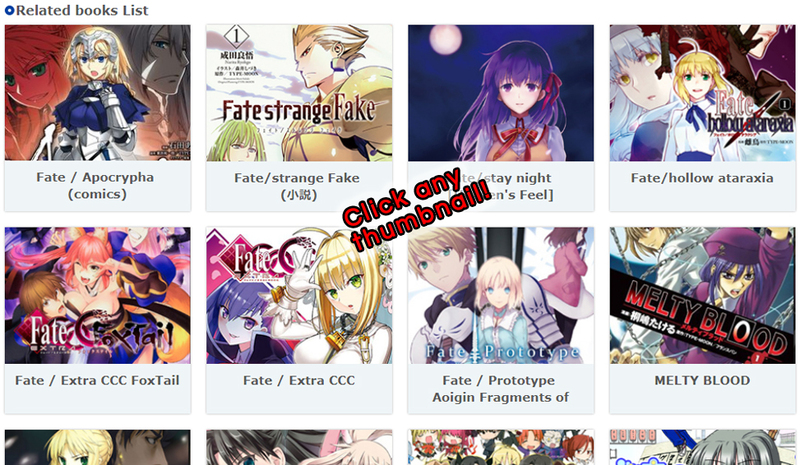 Some of the mini-artbooks can even be downloaded for free. Want to buy original products? Then it’s best to go right to their source. 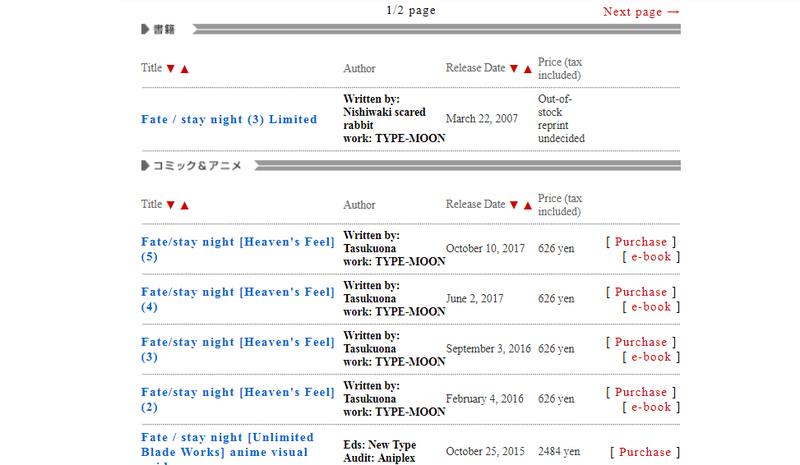 In Japan, Fate/stay night light novels are published by Type-Moon and Kadokawa Shoten, so make sure their official websites are your first to visit. Take note: these sites are in Japanese, so use a translation software (such as Google Translate) for ease of navigation. Type-Moon developed the visual novels that birthed the Fate/stay night franchise. While they don’t sell the books on their site, they supply links to approved stores that sell their products. 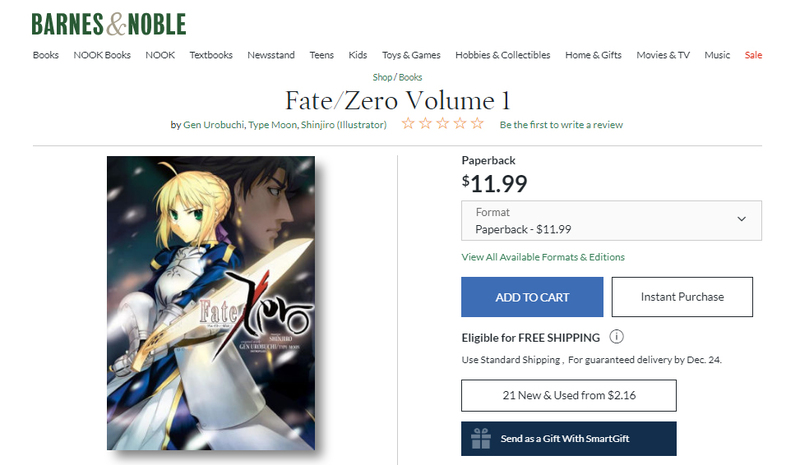 Your first order of business is go to Type-Moon’s ”Book” section. 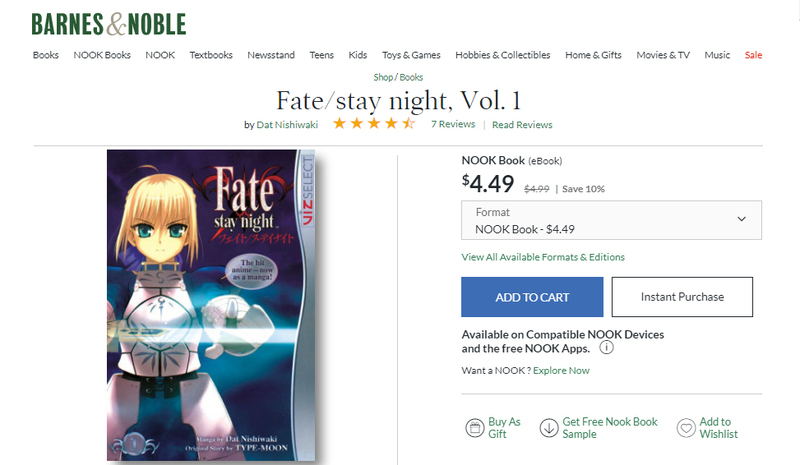 In the “Book” section, under the “Type-Moon Books” subsection, are a series of thumbnails showcasing the various Fate/stay night books available. 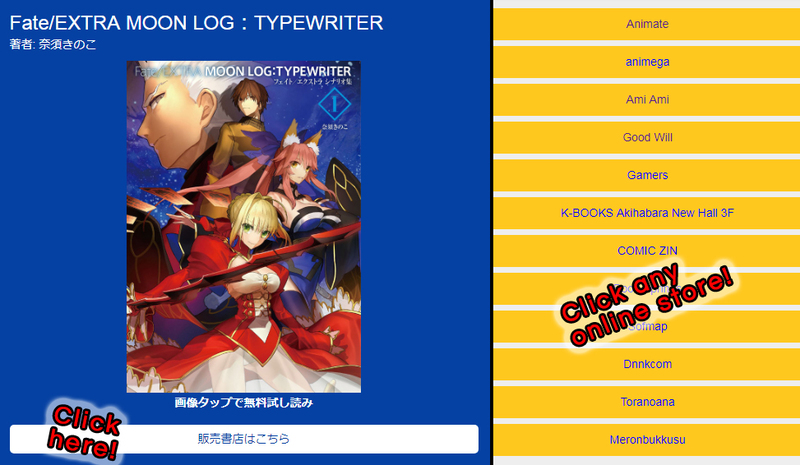 Click on the very first thumbnail to be taken to another page, where you can find links to the aforementioned stores favored by Type-Moon. 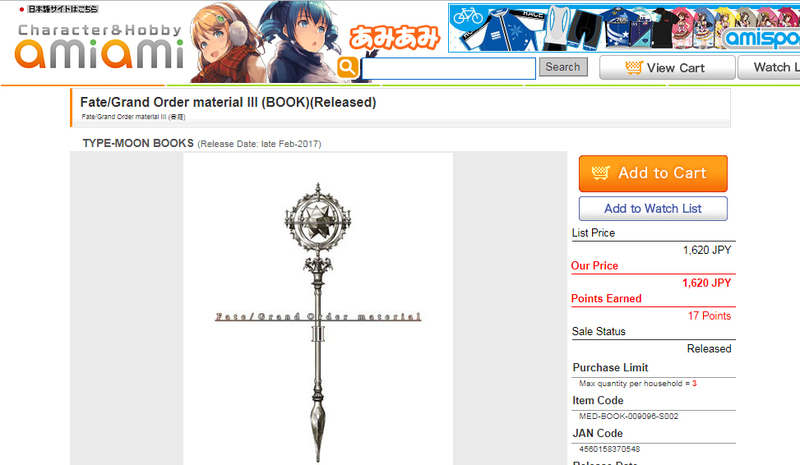 One such store is Ami Ami, where you can buy art books such as the Fate/Grand Order material III. Also in the “Book” page, under the “Related Books list” subsection, are more thumbnails of available books. Clicking on any thumbnail will bring you to the store page selling the item, or a publisher’s page providing links to online shops selling the specific book. 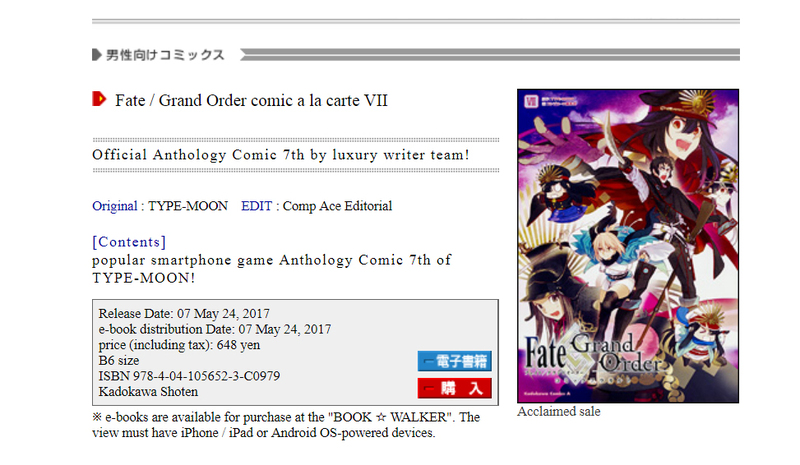 Type-Moon also allows you download a few of the Fate/stay night art books for free as PDF files. Just click on this link to go to their site’s Download section. 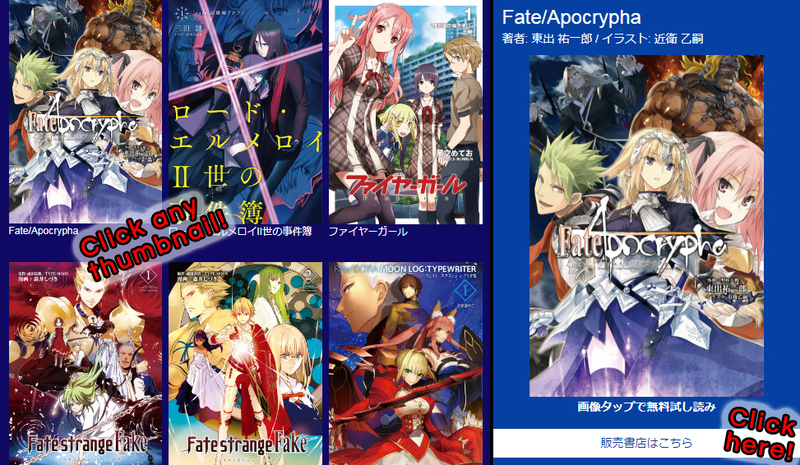 Similarly, Kadokawa Shoten has an enormous list of Fate/stay night literature, including e-books. 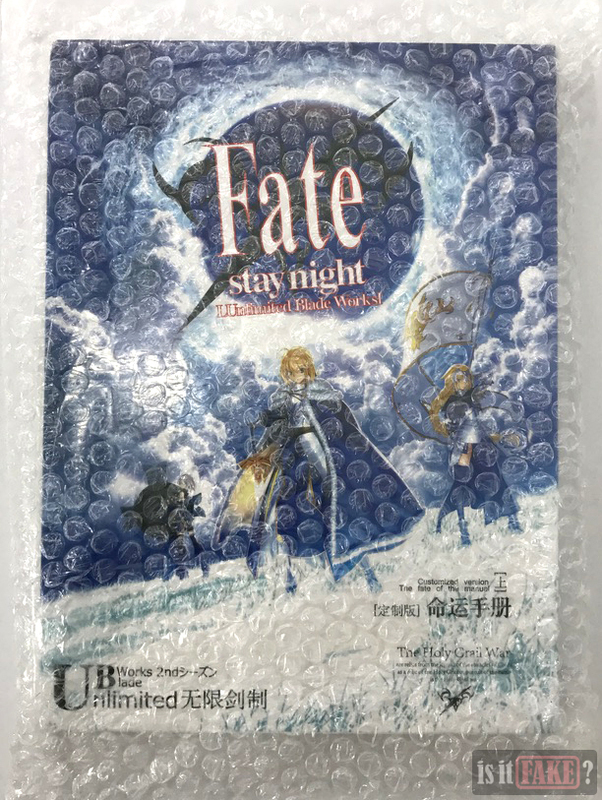 Just type “Fate/stay” in the search bar and start your book hunt. In addition to Type-Moon and Kadokawa Shoten, there’s Ufotable. Ufotable is the animation studio behind the Fate/stay night Unlimited Blade Works anime series. 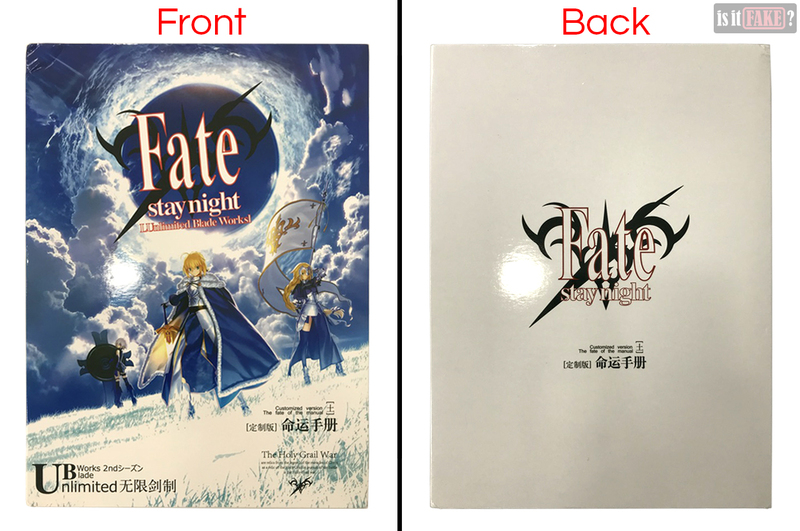 Their official website comes with an online shop where you can also purchase Fate/stay night products. 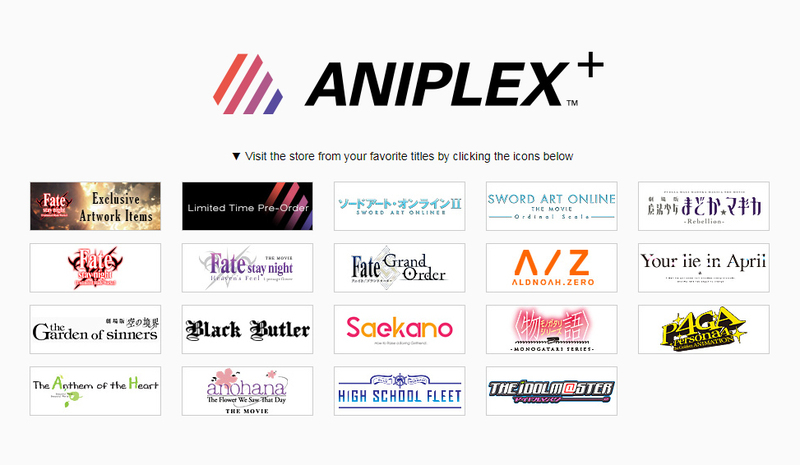 Alternatively, you can visit the website of Aniplex, an American/Japanese distributor of anime products. 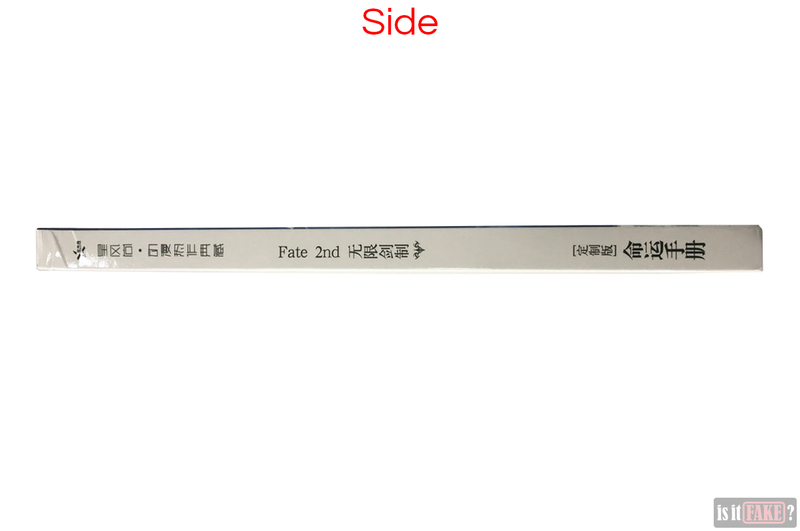 Their site provides links to approved stores that sell Fate/stay night merchandise. 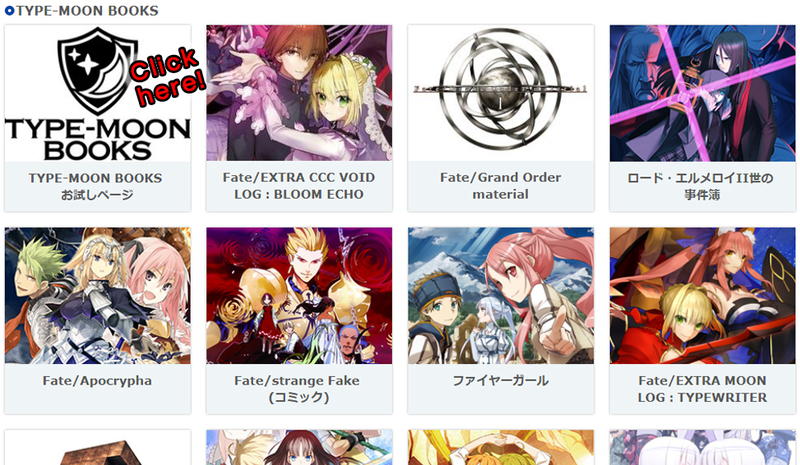 For example, it lists both Right Stuf Anime and Tokyo Otaku Mode as stores where you can buy Fate/stay night books. If you’ve checked out any of the products in the sites mentioned above, you may have noticed all the books are in Japanese. 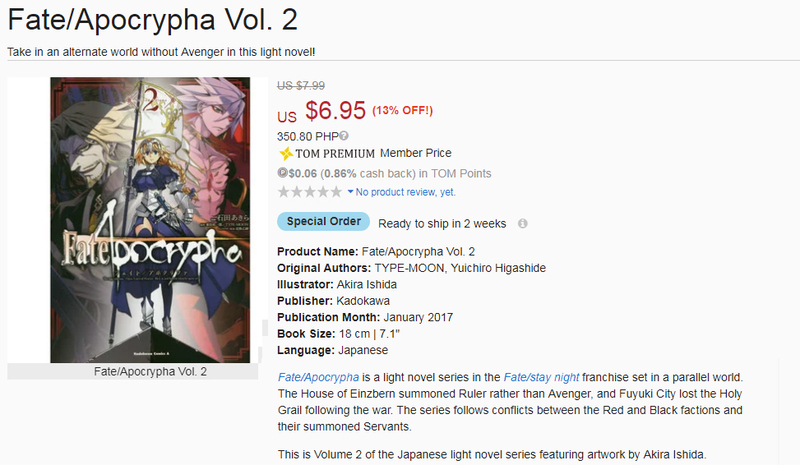 Unfortunately for the rest of the world, many Fate/stay night light novels and art books have yet to be officially Anglicized. 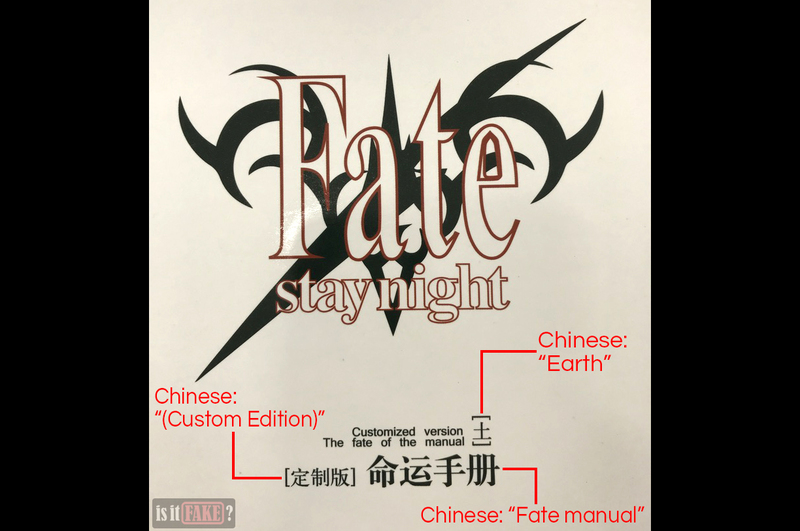 If you want to buy those that have been translated into English, you’ll have to visit the websites of the official Western licensed publishers and distributors of Fate/stay night books. 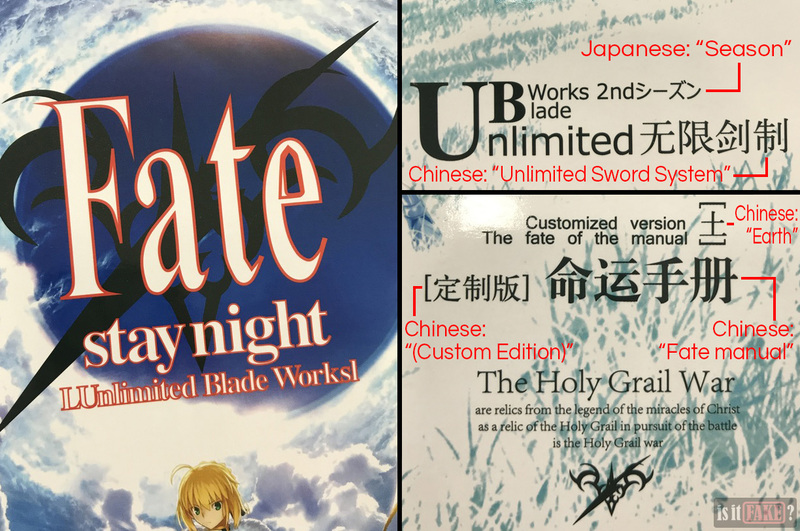 The official English distributors/publishers of Fate/stay night manga are Dark Horse Comics, Viz Media, Udon Entertainment, and Tokyopop. Unfortunately, the latter two no longer have these books available on their online stores. 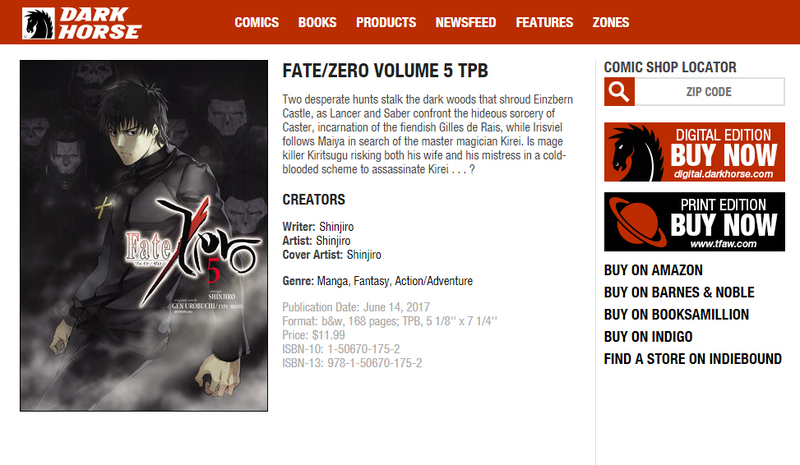 Dark Horse Comics is currently publishing Fate/Zero manga, which serves as the prequel to the Fate/stay night visual novels. You can buy either the digital edition from the Dark Horse Comics store, or the print edition from Things From Another World, an online store linked to Dark Horse Comics. Dark Horse Comics also provides links to other online stores such as Barnes & Noble. 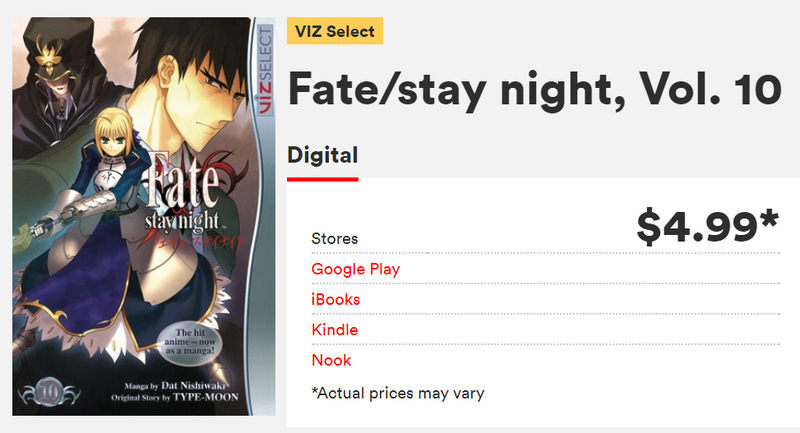 You can also buy digital Fate/stay night manga on Viz Media, which has a list of shops to purchase the books from. You can take your search further to the Things From Another World and Barnes & Noble online shops. 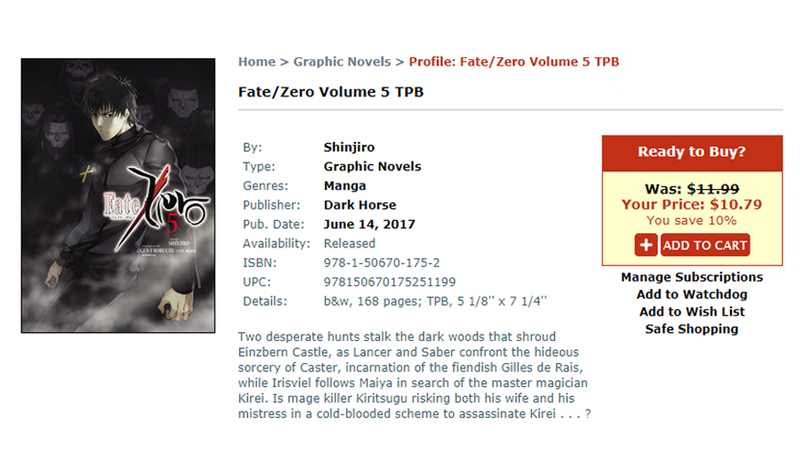 The Dark Horse Comics and Udon-published books are currently available in the former, while Viz Media’s Fate/stay night manga are available in Barnes & Noble. 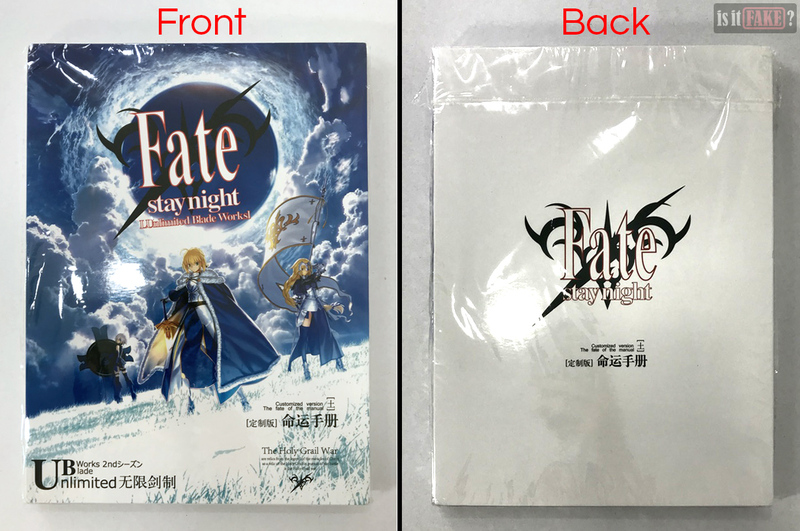 Fate/stay night books are also available on Amazon, but as they’re being sold by third-party sellers, we strongly advise against purchasing from them unless as a last resort. Even then, make sure you do your homework about the seller; read customer and product reviews to see if they’ve been engaged in any shady practices in the past, such as delivering low-quality products to buyers. 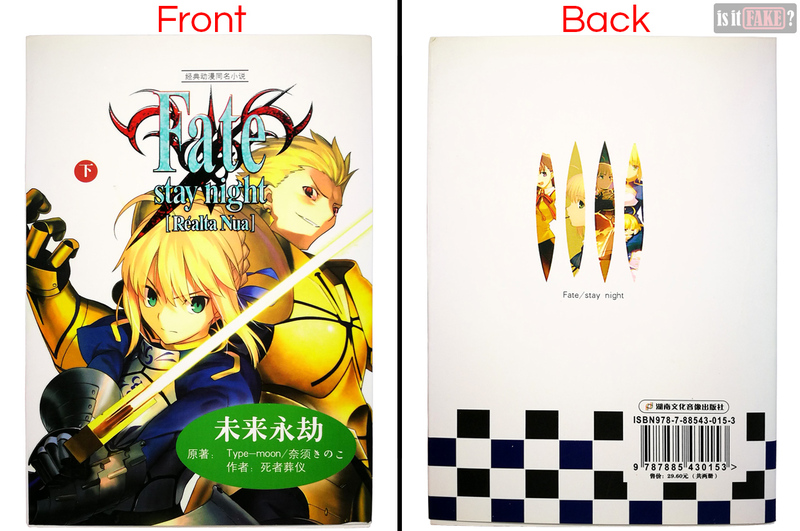 There’s little point in purchasing this Fate/stay night light novels and art book bundle. 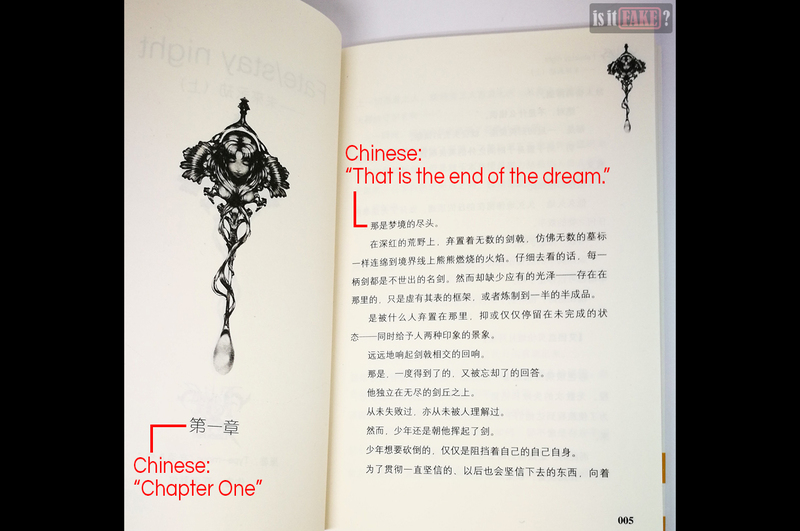 The novels are non-canon fan fiction written in Chinese, and you can find them online, anyway. The art book is a mishmash of images culled from various sources, some of which can be downloaded for free, and the rest purchased from their legit publishers and/or distributors. This bundle deserves no less than an 80% terrible rating.